After visiting Cataloochie in the mornings for elk rut photography, (Elk Photos HERE) our course lay to the east and south as we explored the “Land of Waterfalls”. 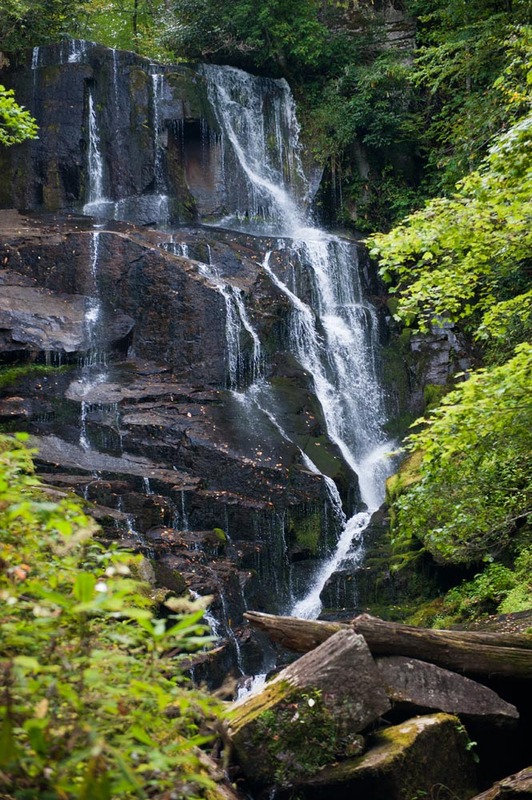 Admittedly, there are many wonderful places to view waterfalls, but the concentration of beauty in Transylvania, Jackson, Macon, and Haywood counties of North Carolina is among some of the finest and most accessible in the country. Population of accessible waterfalls per square mile has got to be among the highest anywhere. Knowing that, it’s not hard to imagine that up to six or seven beautiful waterfalls can be photographed in a day, even with the drives to get there. We stayed in Maggie Valley, which is approximate to the location of the elk, and was our main purpose in traveling to this area at this time of year. However, elk are mostly morning and evening creatures, and tend to head for the tree lines as the sun begins to heat their hides. So, what better to do in the land of waterfalls, than shoot some. We traveled the Blue Ridge Parkway out of Maggie to either NC 107, NC 215 or NC 276 depending on our starting point for viewing falls. It’s generally a 1 1/2 hour drive to get to these parts from Maggie, but it’s always delightful driving these routes as there are so many possible landscapes to shoot along the way, especially in the evenings. You can read my post about Blue Ridge Parkway sunsets and other preferred spots HERE. 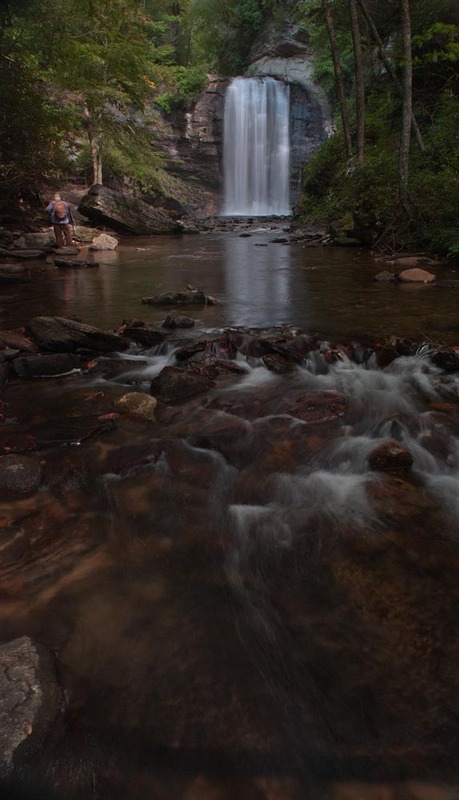 Living Waters Ministry is the home to Mill Shoals and Bird Rock Falls and just down the road is Lemon Falls. 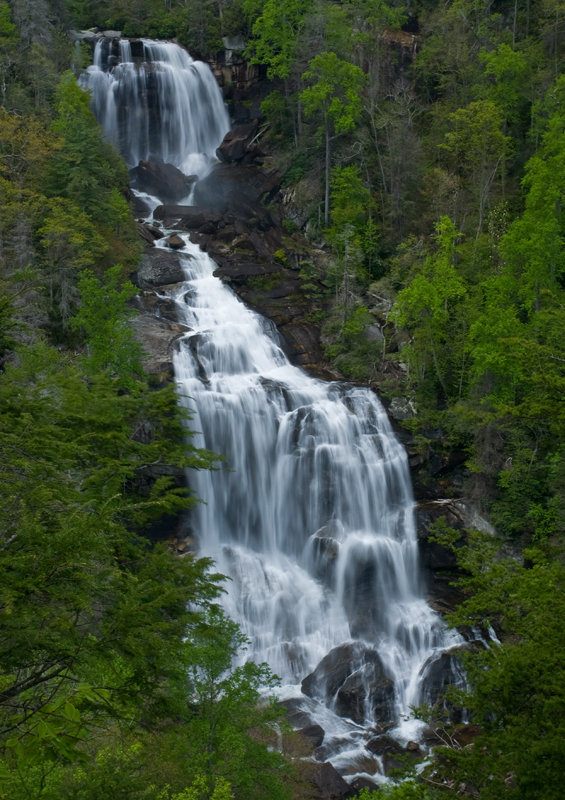 Close by on FR140 is the wonderful Devil’s Courthouse as well as Dill Falls on FR 4663. 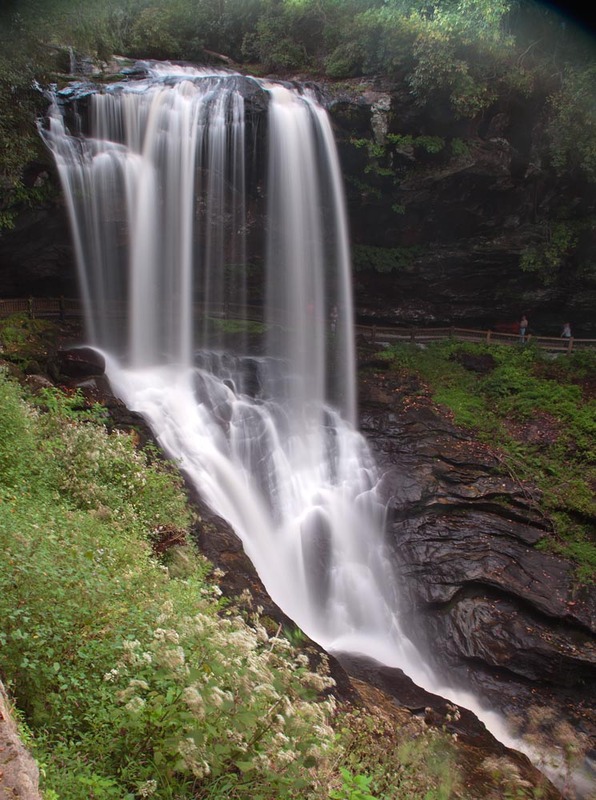 Entering the Pisgah National Forest on NC 276 from the Brevard location will drive you by Looking Glass Falls, Sliding Rock, Moore Cove Falls, waterfall on Looking Glass Creek, as well as an adventure, if you’re up to it, to visit several falls near Log Hollow on FR 475B. There are also numerous other falls in the area which require research and hiking to get to, and are much worth the effort. 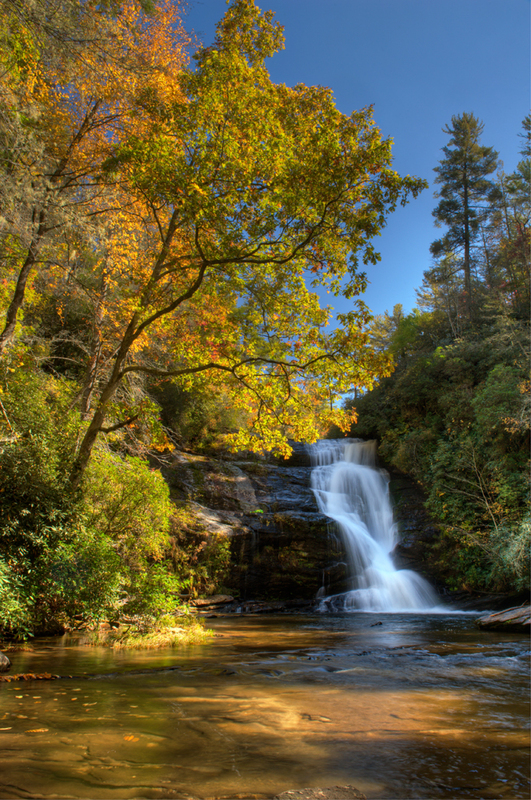 Nearby Rosman hosts the wonderful and extremely beautiful Eastatoe Falls. 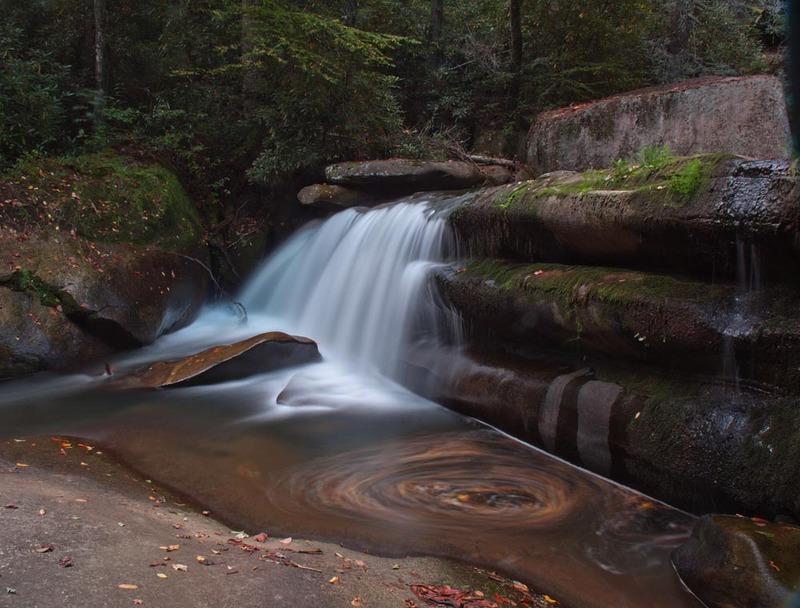 Seen here at low water flow, this 70′ falls is superior photographically in autumn high water situations. Not only is it beautiful, it is a very welcoming and serene place to just sit for awhile. Not heavily visited. Many other places to visit in this area include Dupont State Forest, Gorges State Park, and the “Not To Be Missed” Whitewater Falls on NC 281 just before the NC/SC state line. 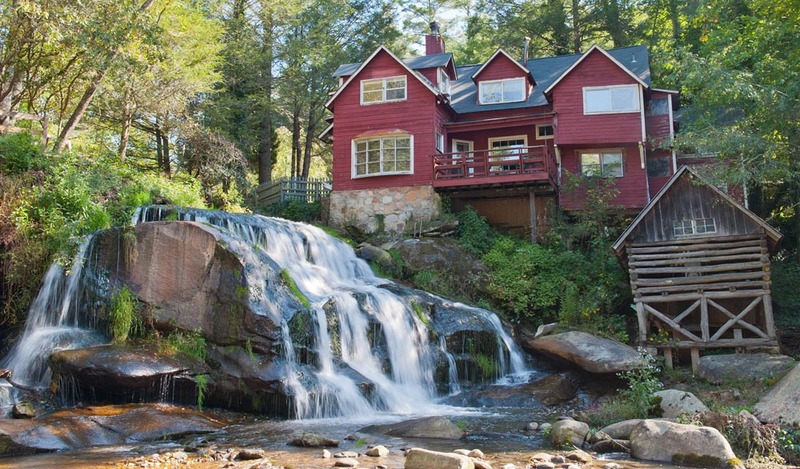 This 400+ foot waterfall is an awesome sight to see. I always try to take my groups here just because it’s so monumental. If you are in this area, you just have to stop here. Leaving Whitewater and heading back toward Maggie, it’s easy to drive US 64 to catch the awesomeness of Dry Falls. There are others in the neighborhood, like Cullasaja, Bridalveil, Quarry Falls, and several other unnamed on the side of the road as well. But there are also a few worth the hike if you have the time, such as Glen Falls on Hwy 106, and Secret Falls on FR4567 south of Highlands. (The shot below is Secret Falls and was taken on my 2012 Trip).